Can the Ravens defense keep the streak alive? Through the first two games of the season, the Ravens have forced a league leading ten turnovers with each game ending in four interceptions and one Terrell Suggs strip sack. It’s almost impossible to keep those averages throughout the whole 16 game season, but could the Ravens defense extend the streak at least one more week? This week’s matchup against the Jacksonville Jaguars gives me hope that there is a chance to match or come close to the season’s turnover averages. The number one reason is Jaguar’s quarterback, Blake Bortles. Bortles has averaged 20+ turnovers through his first three seasons under center and he is coming fresh off a three turnover (2 Int, 1 Fum) performance against the Titans. 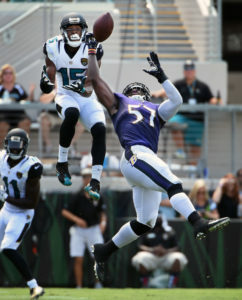 Both of his interceptions came from tipped passes which seems to be the Ravens’ strong suit (See Eric Weddle). The Ravens (Specifically Terrell Suggs) also has forced a strip sack in both games this season. Even though the Jaguars have only given up two sacks so far this season, with the way Terrell Suggs has been drinking from the fountain of youth, combined with Blake Bortles wind-up mechanics, I’m betting with T-Sizzle notching his third strip sack of the season. But, the first key into forcing interceptions and strip sacks, is to stop the Jaguars rushing attack. If Leonard Fournette gets off early then Blake Bortles will not have a reason to be relied on, much like week 1 when Fournette had 100 yards on 25 carries and Bortles finished that game with zero turnovers. With run stopping nose tackle Brandon Williams, being ruled out for the game that will present a challenge. The front seven collectively will have to make an effort to contain Fournette because once he’s on the second level, he is not easy to bring down. Once the running game is contained, if the offense can put up numbers like they did last week against the Browns, Bortles will be forced to make plays and its a go from there. Leave the rest to Dean Pees and this legendary defense. I think the Ravens force 3 interceptions and another strip sack falling just short of the 5 turnover average. But I think the defense will be satisfied with that and a win.